Hello World! provides a gentle but thorough introduction to the world of computer programming. It's written in language a 12-year-old can follow, but anyone who wants to learn how to program a computer can use it. Even adults. Written by Warren Sande and his son, Carter, and reviewed by professional educators, this book is kid-tested and parent-approved. You don't need to know anything about programming to use the book. But you should know the basics of using a computer--e-mail, surfing the web, listening to music, and so forth. If you can start a program and save a file, you should have no trouble using this book. Welcome to the wide-open world of animation. It used to take an empire the size of the Magic Kingdom to make an animated film. And to get viewers, you'd need access to cineplexes or television networks. In other words, you were either in the industry or in the audience. That was then. Today, creating animation for a potential audience of 600 million requires a laptop, a camera, and an internet connection. That's it. The barriers have come down, the people have taken over, and the results are amazing. 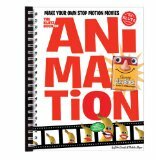 The Klutz Book of Animation is a complete how-to treatment of this newly accessible art form. It combines practical instruction and ready-to-shoot scripts. Real-life samples of all the projects are viewable online the perfect marriage of book and web. Speaking of web, the software you'll need is available as a free download. It's plug and play on any computer (PC or Mac). Attached to the book is a piece of low-tech, non-toxic clay, ready to be molded into a million different heroes starring in a million different films all of them animatedly yours. These beginner mazes combine animal kingdom fun with eye-hand coordination! Little ones love mazes, especially when they re filled with penguins, leopards, crabs and many more critters. Your child can 'help' a kangaroo rat through The Cactus Patch or draw a path through the Swan s Pond. In addition to developing fine motor skills, mazes help increase attention to detail and enhance problem-solving skills. Mazes (Animals), an Activity Zone workbook, keeps little eyes and hands moving! See it done. Do it yourself. It's that Easy! Easy Computer Basics, Windows 7 Edition teaches you the fundamentals to help you get the most from your computer hardware and software. Fully illustrated steps with simple instructions guide you through each task, building the skills you need to perform the most common computer tasks. No need to feel intimidated; we'll hold your hand every step of the way. In full color Learn how to! / Set up and configure your new computer system / Upgrade your computer with new hardware and software / Use Microsoft Windows 7--and personalize it just for you / Connect to the Internet for web surfing, email, Facebook, and YouTube / Manage and edit digital photos / Play, copy, and burn your own music CDs--and download music from the Internet to play on your iPod / Protect your family and your computer from viruses, spam, and spyware / Set up a wireless home network and share your Internet connection with multiple computers Category: General Computing Covers: Hardware, Microsoft (R) Windows 7 User Level: Beginner Easy steps guide you through each task. Items you select or click are shown in bold. Each step is fully illustrated. FOR USE IN SCHOOLS AND LIBRARIES ONLY. Three young firefighters must find matching sets of buttons to complete their costumes for a parade, but should they sort them by shape, color, or size? This is an introduction to the world of machines, from the simplest robots through to the robots which operate complex machinery in factories, hospitals, on space missions and in cars, to the latest intelligent robots and cyborgs. Young readers will discover how the different parts of robots fit and work together and find out some of the many useful things they can do. Projects allow children to build simple robots and machines and investigate the robots all around them in everyday life. These books are without a doubt the definitive and most entertaining biographies of scientists for young readers. Author and artist Mike Venezia provides hilarious, cartoon-style illustrations to complement his easy-to-read text and full-color reproductions of the scientists' sketches and notebooks. More than 50 activities help students develop skills in word processing, spreadsheets, multimedia presentations, graphic design, and using the Internet.